Halesowen claimed another win for their tally and started to put the pressure on league leaders Leek, as they held on to beat Lincoln United 2-1, in what turned out to be a close encounter. The first chance of the game came from Halesowen as Iyseden Christie managed to get some space in the box, and he hit a shot from a tight angle, but he blasted the ball over the bar. 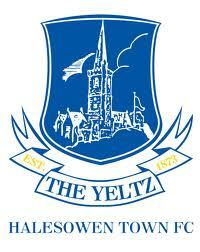 But after fifteen minutes of play, Halesowen broke the deadlock. A cross came in from new signing Kyle Patterson, and Aaron Griffiths managed to leap into the air and head the ball over the keeper and into the net to give Halesowen an early lead. The game fell into a ‘quiet stage’ as the next chance came eighteen minutes after the goal, as Christie had another chance at goal as he hit a shot from distance that was on target, but keeper Craig Turner was easily able to gather the ball on the line. Jean-Michel Gueyes was proving to be a handful as he cut into the Lincoln penalty area and hit a shot that was blocked and the ball flew over the bar. Kyle Patterson was showing his ability as he attempted to chip the keeper from twenty five yards out and the ball dipped towards goal. It would have gone in if it wasn’t for Craig Turner making a great save. Griffiths nearly got his second of the game as a cross from Gueyes flew towards goal and Griffith’s looping header flew towards goal, but he was denied by another great save by Turner. Patterson was incredibly unlucky not to get a goal on his debut, as he ran towards goal and slotted the ball under the keeper. It looked as if the ball was rolling into the net until it rebounded off the post and Gueyes then looked to have tapped the ball into the net, but it was blocked by a defender on the line. Lincoln had their first proper chance at goal, as the corner kick flew into the box and Bruno Holden headed the ball just wide of the left hand post. Christle then missed a sitter for the Yeltz, as the ball flew into the box and landed by his feet. However, he hit the ball, from point-blank range, straight over the bar. Griffiths then grabbed his second goal of the game with an absolute stunner from eighteen yards, hitting a curling finesse shot from the right hand side of the penalty area. It flew into the top left hand corner to claim a comfortable lead for the Yeltz. Then a minute later, the Halesowen defence switched off and after much consideration, it looked that the ball had been knocked in by a Halesowen player as a confusion in the Yeltz box allowed the ball to bounce into the net and Lincoln had got themselves back into the game almost instantly. The referee blew his whistle for full time and the Yeltz held 2nd place for another game, and were starting to put pressure on Leek Town, who were only 4 points clear at the top after their unbeaten start. HALESOWEN: Matt Sargeant, Kristian Green, Asa Charlton, Neil Mackenzie, Joseph Hull, Curtis Tilt, Jean-Michel Gueyes, Tom Tonks, Iyseden Christie, Kyle Patterson, Aaron Griffiths. LINCOLN: Craig Turner, Ian Wilkins, Benjamin Brown, Stuart Reddington, Thomas Batchelor, Andrew Toyne, Sean Cann, Brendan McDaid, Matthew Langham, Bruno Holden, Joshua Bowden. Posted on December 10, 2013, in UTL Archive and tagged Aaron Griffiths, Halesowen Town, Iyseden Christie, Kyle Patterson, Lincoln United, Northern Premier League. Bookmark the permalink. Leave a comment.